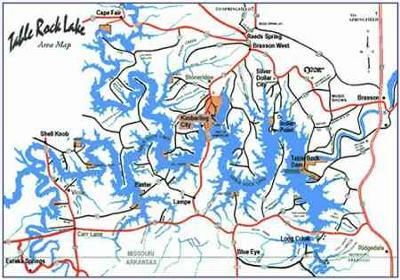 Houseboat Rentals - Table Rock Lake is great for houseboats. Just our thoughts about houseboat rentals on Table Rock Lake, Missouri. We happen to prefer Table Rock because there are very few docks, cleaner water, great fishing, wonderful scenery, several very good restaurants on the water plus you are close to Eureka Springs and Beaver Lake in Arkansas, not to mention 5 miles from Branson, Mo. The lake itself is a lot less congested than The Lake of the Ozarks, and it's a better environment for families, (in our opinion). 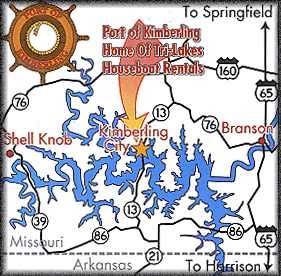 Just in case you would like to know, we have rented from Tri Lakes Houseboat Rentals, which is on Table Rock Lake as that is where Kimberling City is. We have rented houseboats there several times and they are great people. On a final note, we want to thank you for your site, I visit it everyday now. Keep up the good work. Lets make houseboating a household name in the mid-west and a great way to take a relaxed family vacation thatis still as exciting as you want to make it (for the teenagers who might think it's a lame idea for a vacation). God bless you, and have a merry christmas season. Well Mark and Debbie, thank you for the kind words about the website, and the excellent article/post about Table Rock Lakes. And I'm sure our readers will appreciate the "testimonial" about how you enjoyed and were treated by Tri-Lakes Houseboat Rentals. Lastly, hopefully some of our readers will share and post comments about their Table Rock Lake houseboat experiences. Feel free to use the "Click here to post comments." link found near the bottom of this page. Mike & Gerene, you didn't say where in the North you are coming from, the size of your boat, or whether you're moving it yourself or commercially. We have our 40' River Queen at Campbell Point Marina (they have a good Facebook page), which is accessible from the North by route 39 to Shell Knob. Houseboats can be launched below the Rt 39 Bridge over the Lake, and the Marina is about 3 miles East of that point. About 10 - 12 miles Southwest of that point is Kings River Marina. Travel to Shell Knob on Rt 39 with a Houseboat in tow is a job for the pros, though - it is two-lane, hilly & winding. Branson is about 30-some (lake) miles East of us and, if you're coming South on US 65 it's better road, and it probably has better put-in facilities. Probably the largest houseboat marina on the lake is in Kimberling City, on Hwy 13 about halfway between Shell Knob and Branson. It's where we take our boat for service Dan's Marine Service, (417)739-1230), and I'm sure they would do a good job with your launching. I'm happy to recommend them: Good service, and reasonable prices. I am coming to Branson in the next few weeks. I am looking for a place that rents houseboats for half/whole day that has a slide and accommodates 8 people. Couldn't agree more about Table Rock Lake! We moved here 9 years ago, after 31 years of high-taxes and liberal politics in Kansas, and 25 more in New York City, San Francisco and places in between. This 60-mile long (800 miles of shoreline) gem is ideal for house-boating as well as fishing and all other water sports. The lake, behind our house, is 122-feet deep and, in general, the entire lake is deeper and clearer than the more popular Lake-of-the-Ozarks. Not only did our taxes go down 50% when we moved here, we have neighbors from Illinois who paid 3 - 4 times as much than they do now. Slip fees are reasonable, and service is very good. Some marinas are a little more reasonable than ours, but they usually lack amenities like Satellite TV and wifi. We've traveled the world, but if we had to live anywhere else, we'd still come here when on vacation. Table Rock Lake may be the best-kept secret in house boating, so just don't tell anyone, O.K.? The wife and I used to tent camp down on Table Rock but it was 25 years ago and can't remember where it was. We are now almost finished rebuilding a vintage SeaCamper houseboat and want to return this summer. We will be coming down from the north. Where is the best place for us to launch and be able to leave our truck/trailer for a few days at a time(hopefully more than a few days)? Brand New Rental Houseboats on Table Rock! Five Star Houseboat Vacations is a new houseboat rental company at Port of Kimberling Marina on Table Rock Lake. Brand new 2010 luxury houseboats. I agree, the best kept secret is Table Rock Lake. Clean, and friendly people, and a great houseboating experience. We are at the Indian Head Marina, which is aptly run by a great staff.